A steer makes a close inspection Friday of a ten-day-old calf, one of two new additions to the herd at Seaview Farm in Rockport. 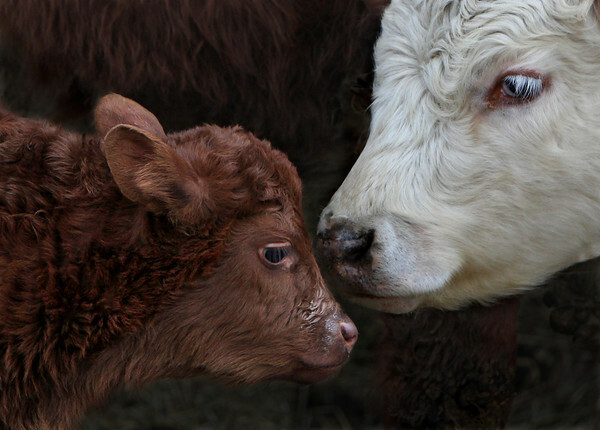 The farm's owner, Ken Lane, said the male calf was born on January 21 and a younger brother was born to the same mother two days later. After a week of being kept separate from the herd, the mother and calves were recently mixed in with the rest of the farm's cattle. The new additions are Devon calves, a breed known for its red coat. Lane said the mother keeps a close eye on the calves and makes sure they are well-fed. "They're very attentive to the calves," he said of Devon cows. "They're good mothers."